The Bruce Museum from Bruce Hurwit on Vimeo. Our Mission: The Bruce Museum promotes the understanding and appreciation of Art and Science to enrich the lives of all people. The Bruce Museum is a community based, world-class institution highlighting art, science and natural history in more than a dozen changing exhibitions annually. The permanent galleries feature the natural sciences that encompass regional to global perspectives. The Bruce Museum is accredited by the American Alliance of Museums. The Museum was originally built as a private home in 1853. Robert Moffat Bruce (1822-1909), a wealthy textile merchant and member of the New York Cotton Exchange, bought the house and property in 1858 and deeded them to the Town on Greenwich in 1908. Year-round. Open on the first Sunday of each month. Free. Family activities throughout the afternoon and talks by experts in the field. No pass required. Complimentary admission for First Sunday programs May - October by alerting front gate staff that you are coming for the First Sunday Science event. For more information, contact Seaside Center Manager Kate Dzikiewicz, kdzikiewicz@brucemuseum.org, 203.413.6747. Learn how the Greenwich Shellfish Commission manages, protects, and preserves their shellfish beds for both recreational and commercial use. The Commission prepares a Town shellfish management plan and promotes the enhancement of shellfish production and harvest for both recreational and commercial purposes in Greenwich waters as well as the preservation and restoration of shellfish habitat and water quality in the GHA. At 2:00 pm, Tim Walsh, Assistant Director of the Florida Turtle Conservation Trust and Collections Manager at the Bruce Museum will deliver a presentation on his research and travels with the Florida Turtle Conservation Trust. Turtles play significant ecological roles, are visible elements in many habitats, and are the 2nd most endangered wildlife taxa in the world. Sixty-two turtle species occur in the United States and many are of conservation concern. While species from areas such as Asia, South America, and Madagascar often receive the majority of conservation attention, the plight of species within the U.S. quietly goes unnoticed. The goal of The Big Turtle Year is to increase awareness regarding the status of these often overlooked species and to emphasize their rich diversity, natural history, and conservation needs. Throughout 2017, Florida Turtle Conservation Trust researchers visited numerous sites accompanied by other biologists and conservationists in an effort to see as many species as possible during a single year, while examining threats and conservation actions needed. Documentary film (1h 28m). Today more than 90 countries have banned shark finning or the trade of shark products. Even so, Stewart finds sharks are still being fishedSharkwater: Extinction (2018) is a thrilling and inspiring action packed journey that follows filmmaker Rob Stewart as he exposes the massive illegal shark fin industry and the political corruption behind it. Today more than 90 countries have banned shark finning or the trade of shark products. Even so, Stewart finds sharks are still being fished to extinction. Bruce Museum has embarked on a transformative, capital expansion and renovation project. The Campaign for the New Bruce includes $45 million in construction costs, as well as $15 million of added support to the Museum's Endowment to ensure sustainability. When complete, this unprecedented initiative will more than double the size of the Museum, from 30,000 square feet to 70,000 square feet, adding state-of-the-art exhibition, education, and community spaces and significantly expanding its space for permanent and changing installations of art, science, and natural history exhibitions. The centerpiece of the New Bruce is a three-story addition to be integrated with the current structure. Designed by the New Orleans firm of Eskew + Dumez + Ripple, the building will open to Bruce Park and feature a façade of cast stone and glass inspired by the striated walls of Connecticut’s historic rock quarries. The New Bruce project – the first since a $4.3 million expansion in 1992 – began with the expansion and improvement to the Museum’s parking lot in the fall of 2018. The next phase of construction is expected to proceed in the fall of 2019 with the renovation of the current changing gallery spaces. These enhancements will be followed, in early 2020, by the renovation of the Permanent Science Gallery. The Museum is expected to remain open during the renovation phases. A construction timetable for the addition will be finalized as the Campaign continues to reach its fundraising goals. In the Museum’s new permanent art galleries, visitors to the Bruce will be able to explore the history of art and return to visit their favorite works. With artworks ranging in date from the fourth century B.C. to the early twenty-first century, the New Bruce will have space to celebrate the achievements of artists from diverse cultures around the world. Gallery space featuring choice selections of exceptional Native American works of art, Asian ceramics and textiles, and Pre-Columbian objects will draw art lovers and historians alike. The Bruce expansion will herald a new chapter in the formation of a distinguished permanent collection that reflects all world cultures. Other permanent galleries will feature artwork from private collectors who have invested in the future of the Bruce through their generous donations to the Museum; these galleries will feature works by Max Beckmann, Winslow Homer, Edward Hopper, Mary Cassatt, Childe Hassam, Lucian Freud, David Hockney, Pablo Picasso, Auguste Rodin, Jean-Michel Basquiat, Andrew Wyeth, and more. Science and Natural History will have a much larger space for both permanent and temporary installations in the New Bruce. Encompassing all of the Museum’s existing galleries, the science wing of the Bruce will now have the space to explore discoveries of the past, present breakthroughs, and the possibilities for the future. The permanent science galleries will be redesigned and reinstalled, adding more exceptional minerals, fossils, and unique specimens of the natural world to the Bruce Museum’s collection. With new lighting and sound effects in the diorama and updates to the interactives that include dinosaurs and live animal displays, the permanent science galleries will present a multi-sensory expedition through the region’s rich natural history. The Bruce Museum’s popular in-house programs for families will expand exponentially. The educational spaces of the new Bruce will inspire wonder, spark creativity, and promote understanding of art and science for all ages. Spaces dedicated to hands-on learning will triple in size. Two new education workshops will showcase interactive activities in art and science, offering families and student groups memorable ways to explore the themes presented in the New Bruce. 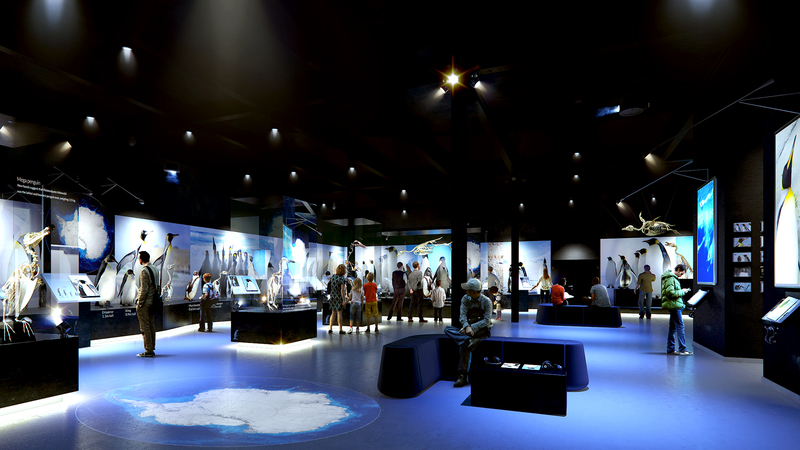 The flexible design of spaces such as the lecture hall will enable visitors to engage with visual culture and the natural world during such events as film series, “lunch and learn” sessions, or drinks and conversation with thought-leaders in art and science. Guests can sip and savor in the new café, enjoying chef-inspired creations and refreshing drinks. Split a sandwich with a friend at one of the 40 tables overlooking the newly acquired Keith Haring sculpture in Bruce Park, or relax and reflect with a glass of wine on the café patio. Equipped with state of the art audio and visual systems, the new Bruce Museum’s unique community spaces will be the perfect setting for your meeting, presentation, workshop, cocktail party, dinner, or reception, with one-of-a-kind backdrops in art and science. Share Our Passion! Grow with Us! You can help us create Fairfield County’s signature attraction and the gateway to Greenwich, offering all of our visitors –from students and seniors, to children and families –the opportunity to encounter world-class art and unrivaled science exhibitions. Join us in transforming the Bruce Museum. Contact Whitney Lucas Rosenberg, Director of Development and Institutional Advancement, at 203-413-6765 or wrosenberg@brucemuseum.org. There are many opportunities to participate at the Bruce Museum. Current and prospective volunteers can find out more here. The Bruce Museum has affiliations with many organizations that offer additional benefits to visitors and members.